1 Cook the pasta until al dente following the instructions on the packet. For penne, around nine to eleven minutes usually does the trick. 2 Drain in a colander, tip the cooked penne into cold water, and then drain in the colander once again so that the penne cools. 3 Take the pine nuts, and toast on a non-stick frying pan on a medium high heat, using no oil. 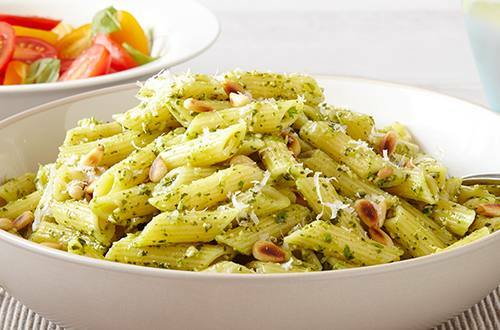 4 Stir the pesto and Hellmann's Real Mayonnaise into the cool penne along with the lemon juice and black pepper. 5 Serve in a bowl, sprinkle with parmesan, and garnish with the toasted pine nuts. 6 Allow yourself a quick snooze.